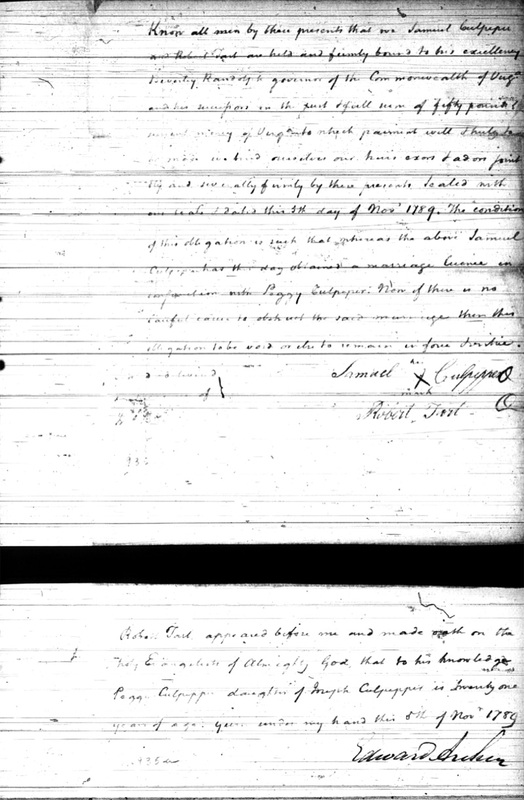 Samuel Culpepper and Peggy Culpepper and Norfolk Co., VA, 14 Nov 1789, Robert Tart, surety, makes oath that Peggy is the daughter of Joseph Culpepper. The couple was married by Arthur Emmerson. S. Culpepper, 1 M0-10, 1 M26-45, 1 F0-10, 1 F10-16. Will* 6 Sep 1812� She made a will at Norfolk Co., Virginia, on 6 Sep 1812, naming as executor(s) John Hardy, naming as heir(s) Nancy Culpepper, Courtney Culpepper, Elizabeth Culpepper and Mary Culpepper, specifically excluding as heir(s) Sion Culpepper. I give and bequeath unto my daughter Nancy Culpeper all my land that is lying in the North side of the new road on the Western Branch & if she should die without a lawful heir of her body it is my desire that my two granddaughters Courtney & Elizabeth Culpeper should have the land I give to Nancy and it is my desire that they shall not sell the said land. I give and bequeath unto Mary Culpeper all my land on the South side of the New road, in case she should die without an heir lawful begotten of her body it is my desire that Courtney & Elizabeth Culpeper should have the said Land, but not never to sell the land. Research note* 11 Sep 2004� Hannah's ancestry is unproven, but she is assigned to this John, as he is the only John known to have been in Norfolk, and been old enough to have been her father, who was not known to have been living after 1791, when Hannah was mentioned in her marriage record as "the orphan of John Culpepper." Hannah Culpepper and George Dorset married in Norfolk Co., VA, on 26 May 1791, orphan of John Culpepper. Hannah makes oath that she is of lawful age. Arthur Emmerson, minister. Willard J. Culpepper, Grand-Son, M, Wh, 12, S, VA/VA/VA. 1840 Census 1 Jun 1840� Sarah was probably a free white female, age 15 and under 20, in Martha Owens's household, on the 1840 Census on 1 Jun 1840 at Norfolk Co., Virginia. Mr. Guy W. Bigham Jr., 71, of Mt. Juliet, died May 19, 1999 in Murfreesboro at Alvin C York Medical Center after a long battle against cancer. The funeral is 1 pm Saturday, may 22, 1999 at Harpeth Hills Chapel in Nashville, with Lt. Edward Lee officiating. Burial follows in Harpeth Hills Memory Gardens. Visitation is Friday May 21, from 4-8 pm and Saturday from 11 am till time of services. Mr. Bingham was preceded in death by his father, Guy W. Bigham Sr. and his mother, Josie Culpepper Bigham. He was a long time resident of Middle TN and was retired from construction management. He was a veteran of the U.S. Navy, serving in WW-II and the Korean Conflict. Obituary of Guy W. Bigham, Jr., “The News Examiner” of Sumner County, TN, May 21, 1999.